Skype urged to come clean on eavesdropping capabilities and policies in new letter. 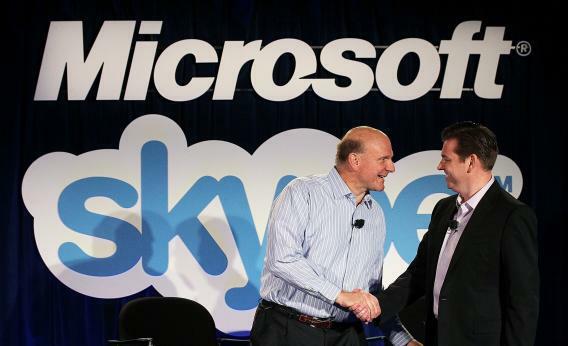 Microsoft CEO Steve Ballmer (L) shakes hands with Skype CEO Tony Bates during a news conference on May 10, 2011 in San Francisco, California. Microsoft had just agreed to buy Skype for $8.5 billion. Every day, people across the world use Skype to communicate. But after the popular chat service refused to comment on whether it could eavesdrop on calls last year, security and privacy concerns have been mounting. Now, in an initiative launched today with an open letter, a wide range of groups and individuals—including software developers, journalists, academics, the Electronic Frontier Foundation, Reporters Without Borders, and the New America Foundation’s Open Technology Institute—are calling on Skype to embrace transparency. The hope is that Skype will rectify “persistently unclear and confusing” statements about the access it can provide governments for surveillance of Skype conversations and the circumstances under which it does so. I have signed my name to the letter, and I should note here by way of full disclosure that I contributed to early drafts of it. (Also, the New America Foundation is a partner with Slate and Arizona State University in Future Tense.) I believe the cause is an important one because many of Skype’s more than 600 million users rely on it for secure communications—“whether they are activists operating in countries governed by authoritarian regimes, journalists communicating with sensitive sources, or users who wish to talk privately in confidence with business associates, family, or friends,” as the letter notes. This is something that worries me, because I don’t think Skype can or should be considered secure. Was Microsoft working to make it possible to eavesdrop on Skype calls if presented with an applicable court order from a law enforcement agency? Had it already built in that capability? The company refused to directly answer these questions. Of course, Skype is in a sticky situation. As one of the world’s largest telecommunications providers, it must be under heavy pressure to help law enforcement agencies pursue investigations, sometimes into serious acts of crime that may have been planned or coordinated using Skype. But if it is building in an eavesdropping function—or has already built in an eavesdropping function—it should be candid about the circumstances in which it will turn over users’ communications. I hope Skype answers the call.